COLOR(S): any shade of gray, grizzle, blue, blue merles with or without white markings. A very adjustable dog breed, this dog is sociable, clever, and calm. This is a friendly breed of dogs. They are also very protective about there family. 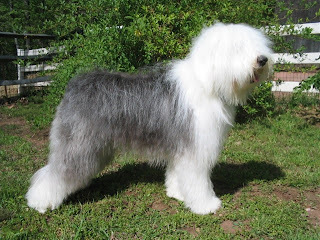 Old English Sheepdog is very affectionate. This trait can be trained out of this breed, however it is usually harmless. They are very good companions of children. An intelligent breed displaying no signs of aggression or shyness. They are ideal for the house. Natural herding instincts are present and would do exceptionally well in country life. Protective and sweet makes this the perfect household companion, and protector of family. This dog has a double coat. This dog breed requires a calm handler as they are stubborn sometimes. A variety of training methods are recommended as this breed tends to do things the way they see fit. A range of training techniques will keep this breed interested and alert. This dog breed loves a long walk. This breed of dogs is usually a healthy breed but it is prone to IMHA (Immune Mediated Hemolytic Anemia), hip dysplasia and cataracts. With a lifespan of 10-12 years this dog can be a great companion for a long time.